Imagine going back to your youth. The glory days of playing in the backyard with your friends, without a care in the world. Now imagine while you are playing you start digging a hole because that’s the kind of things kids used to do. However when you start digging your shovel stops sharply, echoing with the metallic thud only a car roof can make. 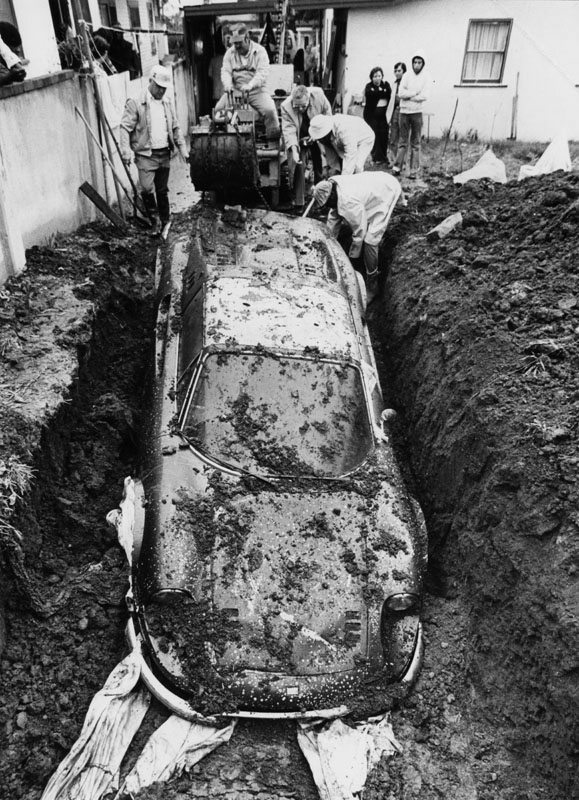 You contact the police, with fears that you just unearthed a dead body buried in a Caddilac. Instead, it’s a Ferrari. One that has been missing for nearly 4-years. It may sound like a far-fetched fantasy, but this is an actual story form 1978. 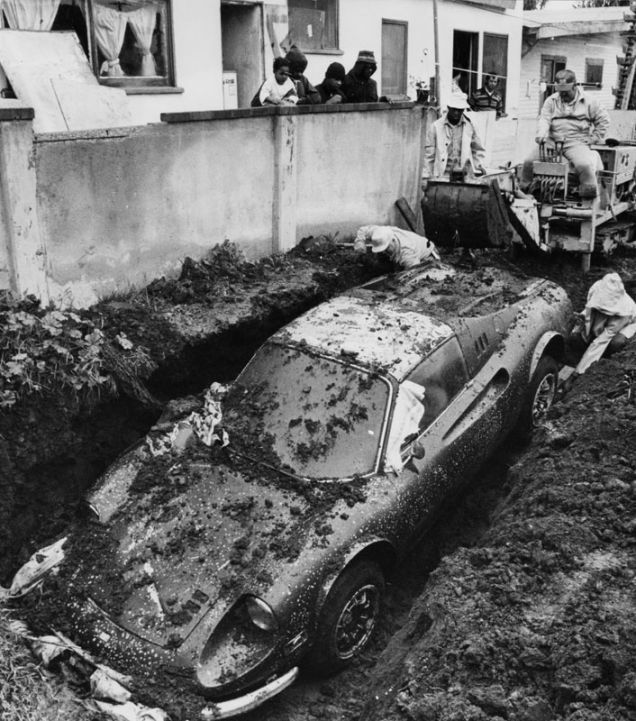 The story starts in 1974, where a plumber bought his wife the ultimate present, a dark metallic green Ferrari Dino 246 GTS. The car was had also been fitted with a set of Campagnolo wheels and Daytona seats for good measure. Wifey had it good. The couple racked up 501-miles, enjoying their little slice of Italy. Perhaps they enjoyed it a bit too much. The couple drove their new Dino to downtown L.A. to celebrate their anniversary, stopping at Brown Derby restaurant on Wilshire Boulevard. Legend has it that the plumber was put off by the Valets rection upon their arrival. Not trusting the restaurant’s employee, he parked the Dino himself on Wilshire Boulevard, forever changing the course of this cars life. The couple enjoyed their meal at Brown Derby, coming outside to the worst sight imaginable, an empty parking stall where your Ferrari should be. Whoever stole the Dino knew there was no joy riding without getting caught, at least not anytime soon. They came up with an elaborate plan to ‘preserve’ the Dino, with obvious hopes of an eventual resurrection. The crackpipe idea the thieves came up with? Bury it, like a dog with a new bone. They stuffed the Dinos’ interior with towels, hoping to preserve the leather interior. They then wrapped the exterior like a mummy, before resting it in a shallow grave. What happened next is the strangest part of this wacky story. 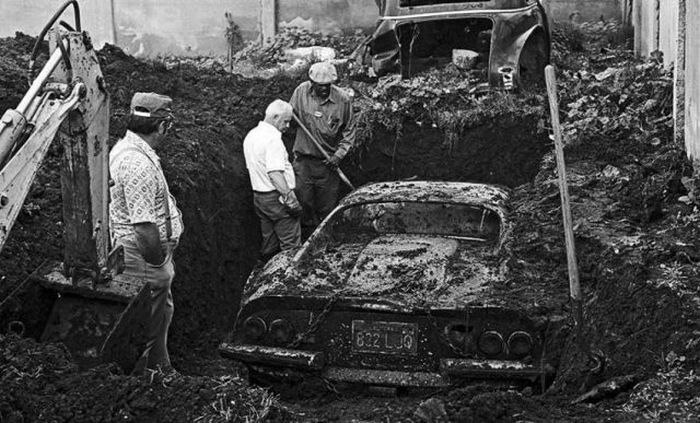 The thieves, the same ones that went through all this trouble of burying an entire car, just vanished. To this day no one knows who, why, or when the Dino was actually buried. It wasn’t until 1978 that the poor Italian finally got to see the sun again, and by this time the earth had taken its toll. While initial reports claimed it had been perfectly preserved that wasn’t the case. The Dino was in tatters, with many considering it well past ruined. But the public didn’t see it that way. Between the police department and the insurance company, they received hundreds of calls offering a cash offer to purchase the Pininfarina basket case. It took some persuasion, but the insurance company finally settled for a high bid between $5,000 and $9,000. The car was off to a new home, a young mechanic who harbored wild dreams of restoring the Dino to its former glory. So did he pull it off? For that, you’ll have to check out Jalopnik’s video on the subject. The answer may actually surprise you.